My Sculpture, Marbled Godwits, has won The Allied Artists of America Marilyn Newmark Award. The exhibit is at the Salmagundi Club, 47 5th Ave, New York, NY, from September 3-13, 2015. My Sculpture, Marbled Godwits, has been selected for the sculpture award in the American Plains Artists exhibit. The exhibit is at the Great Plains Art Museum in Lincoln, Nebraska, from August 7 - October 24, 2015. My aquatint etching, 'DeWinton's Pool', has won The Allied Artists of America Gold Medal of Honor. 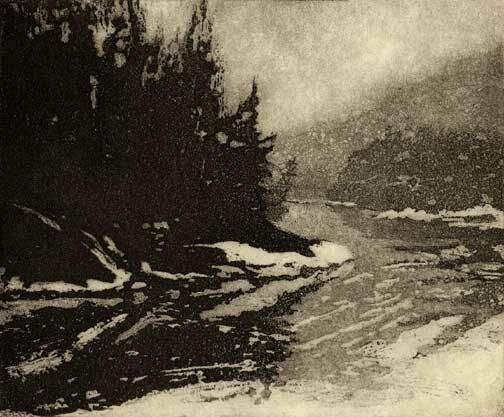 According to Allied Artists president, Thomas Valenti, this is the first time in the organization's ninety-five year history that the Gold Medal has been awarded for an etching. DeWinton's Pool is on Quebec's Grande Cascapedia River which still has some of the best salmon fishing in the world. The pool is named after the Prince of Wales' Private Secretary who fished there in the early 20th century. The 95th Annual Exhibition was on display at The National Arts Club in New York City, from November 14 - December 2, 2008.